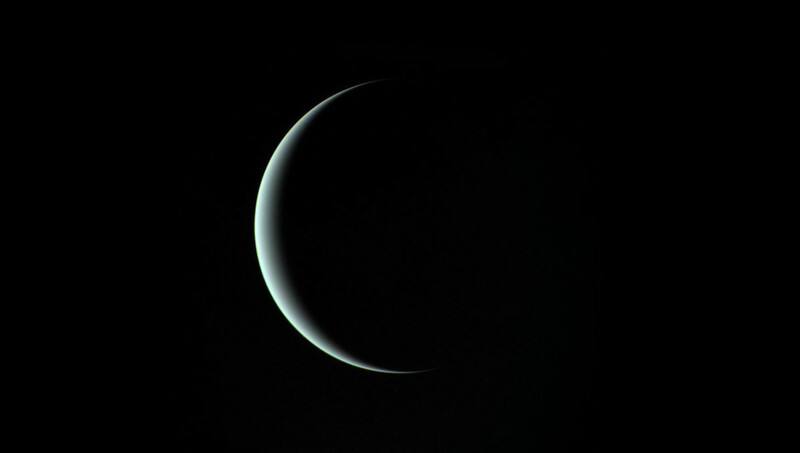 Above: Uranus, the one planet making all of the rounds in your favorite news feeds today, as captured by Voyager 2 in 1986. Credit: NASA/JPL. For those wondering why the May 1st web content on syracuse.com and newyorkupstate.com looks a little brighter (get it? ), I’m passing along here that the article series has been cancelled by Syracuse Media Group. After almost two years, 28 articles (having even gone weekly last summer to coax people out more often with up-to-date positioning and flyover timings), one well-attended solar eclipse, and a short-stack of Uranus potty humor and misspelled complaints about grammar and punctuation (sorry again, Kathleen), readership for the series wasn’t high enough to warrant its continuation. The series was both enjoyable and instructive for my part – having to put together observing lists, keep record of planetary positions to know when to head outside with a pair of binoculars, make Stellarium do what I wanted it to do, and focus a few paragraphs worth of new content at top (a monthly whatever) and bottom (an easily-observable constellation) each month was a great exercise for keeping myself in the amateur astronomy loop, even when the weather conditions in CNY/UNY did not lend themselves to being outside for more than a few minutes at a time. Obviously, it didn’t do much to shorten my sentences. Best of all was the monthly reminder that groups of amateurs all over the state were still hosting public sessions and organizing their own events – and that there are many individuals either hosting their own observing websites or sharing their observing logs and images with their respective member organizations. My thanks to Glenn Coin for keeping astronomy-related content still appearing in syracuse.com and newyorkupstate.com as significant events happen and to Steve Carlic for making the series happen in the first place. Space stories by “not me” always make their way to both websites as well – I am optimistic that Uranus will always coax comments, even if some readers never make it past the title. Finally – as was the point of the article series – if you see an astronomy event in your area, go to it. If you’ve a local club, join it – membership dues keep these organizations running. Most importantly, if you see someone waaaaaay off the scientific mark, find a polite way to correct them or, at least, make it clear to those around them that the facts are out there. Google and wikipedia remain wonderful resources when used correctly.